Overcoming Dream-Stealers with your WHY! They are all around us. Many are close to us. When you dream of change…they squash your dreams and try to CHANGE you back to NOT dreaming. To accepting the status quo. To thinking with limitations to what you are able to be, do or have. We can still LOVE them without allowing our dreams to be stolen by them. You have to be solid in knowing WHY your dream is so important to you that you won’t allow it to be stolen, squashed, or pushed way out of sight. Not only do you have to know your WHY, you have to keep it in front of you (beside you, on you, with you) at all times so that your why gets you past the dream-stealers influence. Why is your dream important to you? What are you no longer willing to accept for yourself? How will your dream coming true change your life? Your answers to these questions will help you write your WHY. 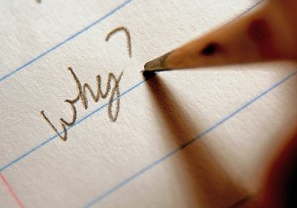 I have a picture of my WHY laminated on a small cue-card sized paper. In fact I have a few of them scattered about my life. I have one in my car, one in my purse, one at my bedside, one in my bathroom and one in my kitchen. On the back I have 5 powerful affirmations that I chant every day (all throughout my day). When someone doubts my dreams, questions my motivation, laughs at my ideas, or suggests I quit…I refer back to my WHY and I am not deterred. It’s my 3 little girls. It’s knowing what my efforts will do to make their lives…our lives better! It’s knowing that they learn by example and leading the way with passion and excitement and without fear of trying to new things. My WHY gets me up early, keeps me inspired when that little voice of fear tries to talk me out of doing things-making calls and ASKING questions, and my WHY keeps me motivated to keep going. There is way too much in this amazing world of ours that I dream of doing, being and experiencing for me to sit back and WAIT for it to happen, or worse, to watch life pass me by and only “imagine” what it could have been like. And the coolest part of the whole experience of pursuing a dream is that the “journey” on the way to fulfilling it is SO very exciting! The anticipation, the planning, the calling and asking and sharing and imagining what it will all be like keeps me so motivated that before I know it…I will be there!!! I have already achieved many dreams…with others I am almost there. Every step closer, I am more enthused, more excited…my heart beats faster…I LOVE the feeling! I LOVE the journey! So, go and dream. Dust off your dreams. Fuel your dreams with your WHY. Cultivate and work your dream – a little bit – everyday. Politely tune-out the dream-stealers, the naysayers and the limit-lookers (they mean well, but they don’t know what YOU are made of, they don’t know your WHY). Before you know it…you will be living your dream. Enjoy the journey!!! Wow! What an inspiring reading! Thank you for giving me back my focus! I reckon something genuinely interesting about your blog- thus bookmarked. Any way I will be subscribing on your feeds and even I success you get entry to consistently fast. Good day! I’m really grateful I came across your post! I love finding new perspectives. But I don’t always have time to read books or long articles. So I often go searching a lot for very good quotes. These quotes allow me to ingest a great deal of understanding in a short amount of time. I’ve started off a quotes site focused on gathering up the best quotes. You’ll find quotes on love and even the best quotes about life. My favorites are inspirational quotes that encourage, invigorate, and catapult you to live life to the fullest!